This aromatherapy wrap is 3 complete wraps in one. The first wrap of hand dyed, hand crochet cotton in shades of early dawn. Metal used is pure silver and stainless steel. There is a real river stone with it’s own clasp to use with your favorite aromatherapy oils. 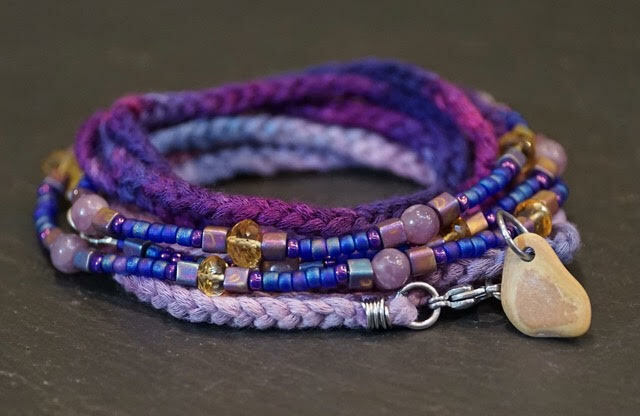 The second wrap is of Citrine, Lepidolite and Raku style seed beads. This wrap is 25.5 in., (65cm.) in length. and 3-7mm in width. The metal used is sterling silver, pure silver and stainless steel. Citrine is for love and acceptance. Lepidolite is for a sense of calm and strength. The third wrap is of hand dyed, hand crochet bamboo in shades of dusk. This wrap measures 22in., (56cm) it is adjustable. This wrap is 4mm. wide. Metal used is stainless steel and pure silver. Together they create a wrap that shows a day in one’s life.